Once you have narrowed your choice down to two excellent mandibular advancement devices, all you need is a fresh, objective look at both of them in order to know for certain which one of them is the right choice for you. We have made this VitalSleep VS SnoreMeds comparison for that purpose. See how well these devices satisfy our criteria and which one of them we believe is the more reliable and effective snoring aid. With VitalSleep, you are getting a mandibular advancement device that is well known for being one of the most customizable options on the internet. VitalSleep allows you to micro-adjust the device until it is perfect for your jaw and mouth. SnoreMeds can solve your issues with snoring and breathing by repositioning your jaw, pushing it forward. It uses the boil-and-bite method and features holes that allow you to breathe through your mouth. It is really affordable as well. VitalSleep mouthpiece is designed to last a full year. However, you should ideally replace it once in every 4 months. VitalSleep mouthpiece is made of a medical-grade, non-toxic material that is 100% latex and BPA-free. The material is designed for comfort and well-known for its ability to achieve and maintain a perfect fit. Vital Sleep mouthpiece comes in two sizes, regular for men and small for women. The perfect fit is achieved by following the traditional boil-and-bite method and fine-tuned by turning the hex screws with the included tool. With Vital Sleep, the adjustment period typically lasts for a couple of nights. VitalSleep mouthpiece can help you reduce your snoring the very first night. It is designed to gently push your lower jaw forward, which prevents your tongue from falling to the back of your mouth and creating blockages that obstruct the natural airflow. VitalSleep mouthpiece is extremely easy to maintain, but it does require cleaning every morning after you wake up. You can clean it with a toothbrush and some toothpaste or you can soak it in a cleaning formula and leave it there for a couple of minutes. Make sure the device is completely dry before storing it in its protective case. Individuals with sleep apnea (as an alternative to CPAP therapy). VitalSleep Mouthpiece comes with a 60-day money-back guarantee. VitalSleep features a 1-year warranty for all potential defects in material or workmanship. The warranty covers all replacements, no matter the reason. 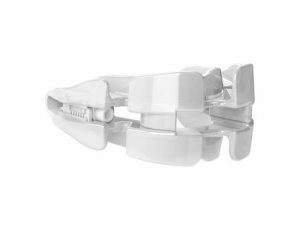 SnoreMeds mandibular advancement device is manufactured to last up to a year. However, the company recommends replacing it every 3-4 months for the safety and hygiene of your gums and teeth. SnoreMeds is made of top-quality anti-allergenic thermoplastic. The material is 100% latex and BPA-free and approved by the FDA for medical use. SnoreMeds comes in two different sizes: one for men and one for women. After choosing your size, you mold the device to your mouth using the boil-and-bite method. Note that the mouthpiece can be molded only twice, so take your time and follow the instructions to the letter. With SnoreMeds mouthpiece, the adjustment period typically lasts from 3 to 5 days. If you are experiencing discomfort after 5 days, you should check your fitting and perform the boil-and-bite procedure again. SnoreMeds mouthpiece is designed to support your lower jaw in a forward position. The device repositions your jaw by 0.1 inches, which is enough to keep your airways open throughout the night and ensure a natural airflow. If you are a tongue-based snorer, this device should relieve your problem the very first night. SnoreMeds mandibular advancement device is cleaned with the provided spatula. You should also use a toothbrush and some toothpaste to clean the mouthpiece. Alternatively, you can clean it using a Polident tablet or mouthwash. SnoreMeds comes with a 45-day money-back guarantee. You can return the product within this timeframe and receive a refund, minus the shipping costs. SnoreMeds does not come with a warranty. I've tried countless mouthpieces, nasal sprays, chin straps, you name it. This is the only product that allows me to open and breathe through my mouth and as eliminates my snoring at the same time. My wife pretty much gave up at this point and we seriously started considering surgery they'll fix my snoring once and for all. This mouthpiece saved me from going under the knife and since I'm already used to wearing mads, it was pretty comfortable from the get go. I tried a few other attempts to reduce/eliminate my snoring. My wife was not sleeping well, which was not in my best interest. The vital sleep mouthpiece has totally eliminated my snoring. My wife is much happier in life now. The mouthpiece is a bit uncomfortable, but it doesn't bother my sleep. I actually sleep better now, since my wife doesn't wake me two or three times each night. This may not be the device that solves your problem, but if it does, then it's a great blessing. It's simple to set up and easy to use. Vital Sleep has changed my life! My husband has become a pretty consistent snorer now and we've tried other devices and recommendations, Nothing was helping....and then my friend - who's also got a snoring husband - recommended Vital Sleep and I can honestly say, it's changed my life completely! I don't find myself waking up all throughout the night to give him a gentle nudge because his snoring has virtually stopped. My sleep is 100% improved and it's made a huge difference in our lives! He's sleeping much better as well and it's also far more comfortable for him to wear which makes a big difference too, I would highly recommend it to anyone who has a significant other whose snoring is keeping them up! This device scared the bejesus out of me when I first saw the commercial, it just looked like some ET creepy instrument from movies. However, a couple my coworkers are using it so I decided to give it a shot. I have been using Vital Sleep for two weeks give or take a day or two and I am so happy with it. It’s not that uncomfortable and I imagine after a few more days it will be like it’s not even there. And my snoring (and my sleep) has improved by far. This was the only mouthpiece I was able to fit inside my mouth. It doesn't fall out during the night, it molded perfectly to my teeth, and most importantly, keeps me absolutely snore free. You know you have a serious snoring problem when your wifey starts bunking with the kids…It was terrible, my throat was so sore every morning and I was always sleepy. That is until I tried SnoreMeds. I got a Value Pack for men which contains not one, not two but four mouthpieces and a travel case, and I gotta say I’m very satisfied with this product. The price is very good, especially the value pack, witch which Im probably set for life. The moutpieces are solid, but soft, comfortable as much as an a oral snoring device can be, and they’re easy to fit. I think this is a very good product and I recommend it to everyone who wants to reduce snoring and start sleeping better. We are both using SnoreMeds, and we are so happy. NO more waking eachother up in the middle of the night with our terrible snoring. Now we can finally go on trips with friends without being embarrased by our snoring. SnoreMeds is great! Good value for money and reliable snoring device. My snoring got better by some 80% which is amazing. VitalSleep anti-snoring mouthpiece is one of the few MADs that allow for double customization through boil-and-bite fitting and micro-adjustments. Read our thorough analysis of the device and learn what snorers have to say about it in user-written VitalSleep reviews.